NOTE: These can be made in Jumbo muffin cups. Serves 8. They can be prepared ahead of time and refrigerated or frozen until needed. Crumble and cook sausage in skillet until brown. Drain. Spray muffin cups very well with cooking spray. Break apart triangles of crescent dinner rolls, roll into ball, press flat to cover bottom of muffin cup and up the sides. Add cooked sausage (divide between 8 cups). 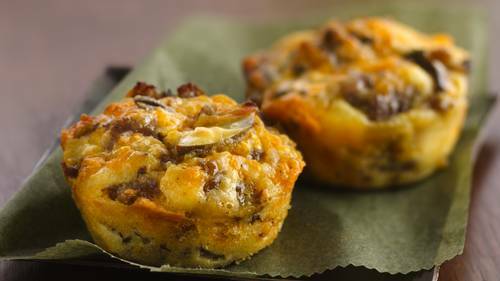 Pour into muffin cups over meat and cheeses (they will be full to the top). Bake about 40 minutes or until tops are brown. Be sure eggs are cooked in the center. It is good to line the bottom of the oven with foil or baking pans because it often overflows. To prepare later: These can be frozen after they cool off. Let thaw before heating. Spray baking pan thoroughly with cooking spray. Put muffin cups on pan. Cover tightly with aluminum foil. Heat in 350 degree oven for 25-30 minutes.